Successfully saved Chicken Gyro Salad with Tzatziki Sauce to your Calendar. You can also save the ingredients to your Grocery List. Rather than traditional chicken gyros I deconstructed things by adding veggies and turned gyros into a salad. Healthy, easy, ready in 20 minutes, and packed with so much flavor. Chicken is quickly sautéed with olive oil, red wine vinegar, lemon juice, and oregano. It’s moist, juicy, and has the classic gyro flavor you’re looking for. 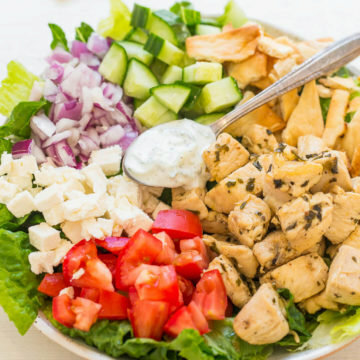 It’s added over a bed of lettuce, tomatoes, cucumbers, red onions, pita chips and topped with tangy, dill-infused tzatziki sauce that coats everything with cooling creaminess and the flavors include Greek yogurt, cucumber, lemon juice, white vinegar, garlic, and dill.